We ran a social media series highlighting ways in which girls, and more broadly, women, show up in or influence rock art as we celebrated the International Day of the Girl late last year. As we mark the International Women’s Day today we share 3 links we found between women and rock art. In ancient Cahuilla North American rock art, girls undergoing initiation into womanhood painted spirit helpers they had seen in visions in visible sites in their communities at the end of their initiation rites. This is similar to a tradition in Malawi. In the Dedza-Chongoni area of Malawi, a secret initiation rite known as the chinamwali marks girls’ entry into womanhood. While the girls learn stories, songs, and expected behaviour and roles from older women, they paint on the rocks as a mnemonic device. This frieze is from a shelter in Namibia’s Brandberg. It shows a row of young girls possibly walking to their initiation and with a guide at their helm. A San painting, it is finely detailed: the girls wear what might be beads across their heads and some form of headdress. Fascinatingly, a barely there figure is painted behind the girls perhaps indicating a spirit helper or guide. Around the girls, animals known to be revered by the San and considered reservoirs of potency, such as the giraffe and antelopes that might be kudu or springbok, are painted as well. 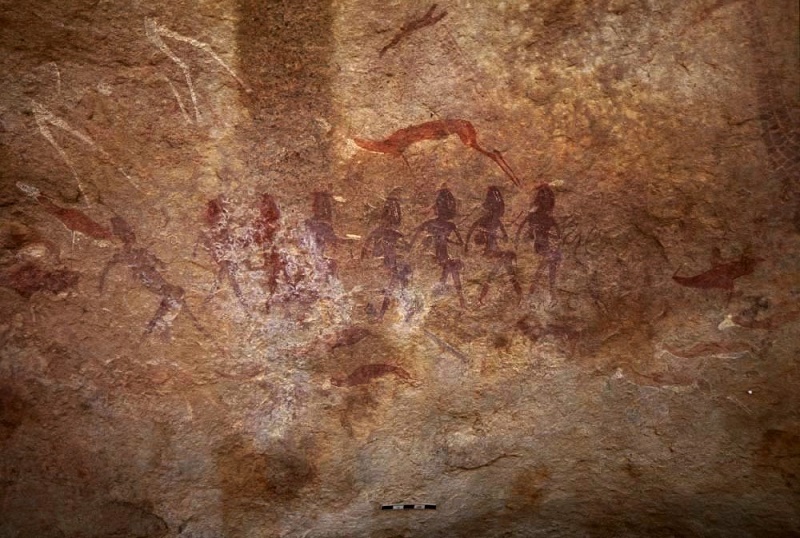 This is only one of more representations of women in African rock art. In other paintings, women are shown tending to herds of cattle, in various domestic scenes, or participating in healing dances. In 1879, Maria Sanz de Sautuola accompanied her father, an amateur archaeologist, to a cave on their property that he had been investigating. While her father worked, Maria wandered off deeper into the cave. Happening to glance upward, she screamed out to her father to come see the amazing oxen-like creatures that were painted on the cave’s ceiling. She had just discovered the cave paintings of Altamira, Spain. Closer home, the only currently-active woman Somali archaeologist, Dr. Sada Mire, blazes a similar trail. She moved to Sweden as a teenager when civil war started in Somalia. It was in exile that a passion for discovering her own history developed and she decided to study archaeology. In particular, the sentence, “In order to write African history, we need to do archaeological research” found in a book inspired her ambition. 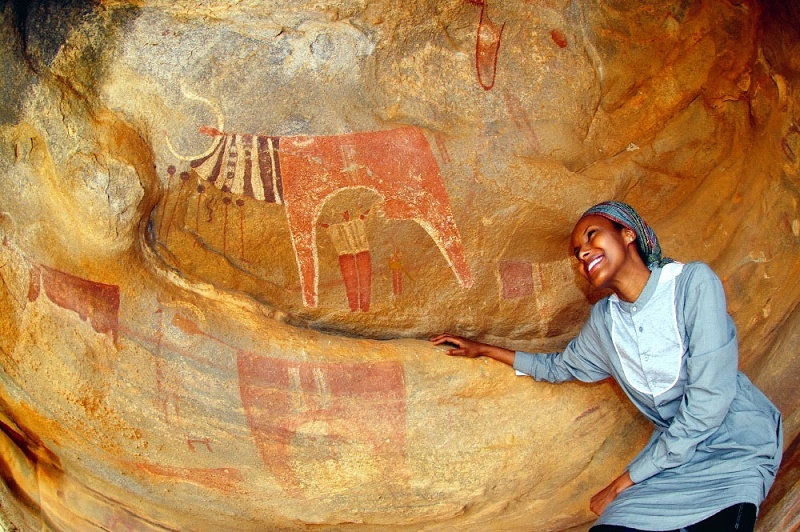 She has discovered numerous prehistoric painting sites including the only one known to depict sheep (Dhambalin) in Somaliland. 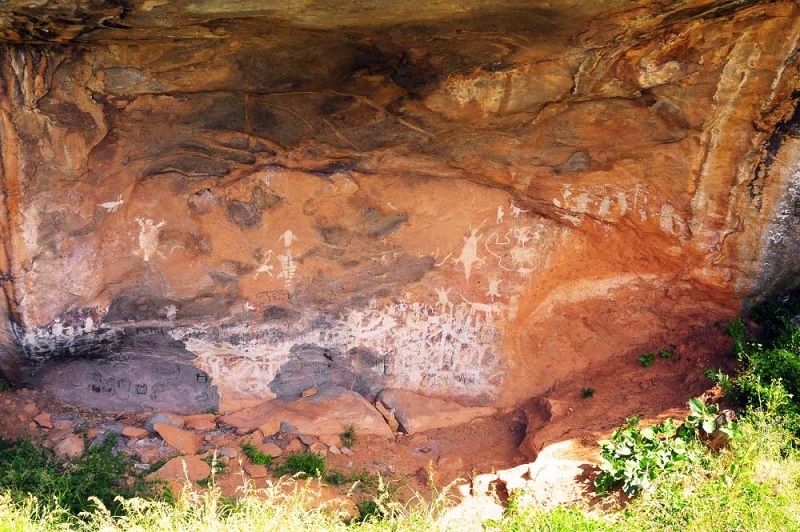 In our outreach work we seek to reach students and share with them the great heritage that is rock art. Our travelling exhibition ‘Dawn of Imagination’, for example, incorporated student engagement in the form of essay competitions, and rock art knowledge games. Below are some excerpts. Just like Mary Leakey was inspired by cave paintings she visited at a young age to pursue a lifelong career in archaeology, and human history, we’re hoping prehistoric art will inspire generations of young women, and men, to be interested in their rich past.